Well hold your horses right there Councilor Ritchie. Remember that we are talking about a recent building, a simple glazed black box poised precariously above the pavement. Remember also that we are talking about possibly the most dull piece of architecture that the firm of Athfield Architects has ever foisted upon this city. The sleek mirrored curves of the Library that snake around the back of the pools of the City Gallery right next door is fantastic, and would be worth fighting for. The WCC building on the other side is an interesting example of italianate post-modernism complete with colonnade below, square window openings, and floating loggia above is also interesting in its own way – I’m not sure if this is an Athfield building or a Moller design (both architects were working on the Civic Square project from what I can recall). There are going to be a massive amount of buildings coming up for demolition, and ensuing cries to save them, and this particular building would be right down my list in terms of effort for saving… pretty much near the bottom in fact. In terms of architectural merit, it is completely hum drum. It’s just… Meh. While I think we can all agree that, yes, the “Portico” does provide a grand archway (of sorts) into the Civic Square, it is not so much a “sculpture” as a simple black box – a negation of space – and a hard-to-maintain (and awkwardly detailed?) lumpen mass. It is deliberately mute – providing a quiet link between point A and point B, without trying to introduce a third strong architecture to combat the other two. Does that work though? Or is it more that the black glass, instead of fading into the background, instead maintains a far stronger, heavier presence in real life? If you really wanted it to go away, then a completely clear glass might have worked better, or even a highly mirrored silver finish. As it is, it only looks less than scary at night. Let’s face it – it is not a thing of beauty. It is, however, a thing of immense weight and size and the prospect of it hurtling down into the assembled throngs below is something that we should all be extremely scared of, if there is any truth in the rumour that it is to be demolished. But is there? If a building, of obvious high catastrophic collapse potential, is actually in real danger of collapse, then action is called for: but certainly the Council should not have to demolish. The architects and (more importantly) the engineers both knew what it was being designed to do, ie span across a massive gap. Presumably it is tied firmly at one end, and has a mighty set of rollers under the opposing lip, to allow for significant movement in the case of massive seismic action. Either that, or it has secret hidden legs inside the building at either end (which seems unlikely). It is not the sort of thing that can be supported just from one end only. Looking closely at it last night, there is a mighty metal bracket sticking out of the side of the Library building, and so presumably rollers at the WCC end. 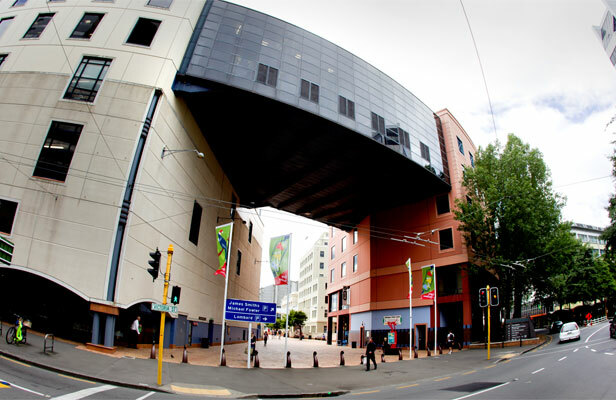 In the case of catastrophic collapse of a building at either end, then of course, with the present building, the giant portico would smash down onto the hapless Wellingtonians below, making one helluva mess and blocking off access into the Civic Square (which, to be honest, would be the least of their problems). Those still underneath the building would of course be rather heavily dead. All of this would have been understood by the engineers, and the portico building would surely have been carefully designed to take into account all those horrific possibilities and make sure they were designed out and could never happen. It is only since the CTV building collapse that the public’s eyes have been opened to the possibility of the total pancaking of buildings (well, the World Trade Centre as well, I guess), but the architects (known) and engineers (unknown by me at this point) should have been well aware of this at the design stage. All that aside however: it is a dull piece of design, regardless, and if the building needs some massive seismic upgrading, the City should take the chance to upgrade the architecture as well. For years there has been this baleful black glass, complete with three sets of what appear to be external doors/grills apparently opening out into nothingness. I get the feeling that somewhere inside the building there is a locked cupboard, with a sign saying in big bold letters – Do Not Open (unless equipped with a parachute). Is that possibly the way out for the window cleaners? On the street side, six similar grilles do a similar job. Not a pretty sight. The detailing is, overall, very plain and simple, resoundingly negative, as befits a building that is trying hard to not be there. In terms of urban design, it is trying to do one thing: be a portico, a piece of the grand archway, a simple span to contain the space within the square, while in terms of architecture it is trying to resolve the two very different buildings within the square. I suppose that under those conditions, the spanning archway could be nothing more than a bland intermediary, but personally I have always felt affronted by the brutishness of the bald black box. A better solution than the retention of something so painfully implanted, might well be to demolish and rebuild, or even just to demolish and be done with it for all time. Yes, it provides a space for the Council offices to overflow, and to connect seamlessly with the Library, although I’m not sure that anyone in Council ever uses this interconnect function – and anyhow, what is wrong with just opening the door at ground floor and walking there like the rest of us do? While the Portico does provide some sense of enclosure within the Civic Square itself, it also provides a visual block from almost everywhere else into Civic Square. It’s big and black and ugly and we could do far worse than just be rid of it for all time, opening us up to a back drop of the Dominion Building on Mercer St and the Evening Post building on Willis St. How about that for a starter for ten, Councilor Ritchie? Can’t say I’ve noticed it much, including the one time I walked through it. Surely a rope bridge would be more appropriate, both from a Jacksonville and democratic metaphorical perspective. S&T did the Civic Admin Building… in all its post modern ‘glory’. I do like the idea of a rope bridge! I like the idea of the library being a stand alone building. I think the portico seems a bit too much like an overground version of an underground tunnel connecting two buildings. As a way for council staff to get between buildings without needing to interact with citizens. I think Civic Square is too closed, and also it is underused for a pleasant traffic free spot that is sheltered from the wind. There probably isn’t much you can do to improve the situation on the city side, although removing the portico would be a visual improvement. It’d be nice to drop the quay below ground level in a war memorial style tunnel, demolish the bridge, and open civic square up to the waterfront at street level. Then the walk way under the current portico would be a natural gateway to the waterfront. And the extended Civic Square would have a lagoon at one end. My disquiet has always been greater with the strangely squat base of the library facade. All that hefty masonry seems to have driven the colonnade into soft ground beneath. Either that or the front yard has silted up rather badly. Yes, Starkive, you’re right about that! I too have always thought that the hobbit-sized colonnade on the Library was one of the most uncomfortable things about the building. Never good to be able to bang your head on a ceiling of a building, especially if it is precast concrete. Silted up is a good description. Well-proportioned, this building is not. DavidP – good observation. The lowering of Jervois Quay into a tunnel so that the Civic Square has been suggested so many times, but sadly is unlikely to ever happen due to the massive cost involved. It is a major route for services, which would be expensive to move, and it would also act as a giant drain sump in the case of heavy rain and a nightmare in the case of any tsunami. But yes, Civic Square could easily be invigorated by bringing more commercial activities into the Square. The Civic building acts as a deathly dull killer of life in the Square. Denny – if S&T did the Civic building, did they do the Portico as well? S&T did the Civic Admin Building but Athfield’s did the portico. It does get quite a lot of foot traffic through it from the Civic building as the third and fourth floors of the library building are not occupied by the library itself but by various other Council departments (I used to go up there quite often when the Capital Development Agency was based up there before they became Grow Wellington). I have heard that this has long been a frustration for the library as the WCC have never allowed them to occupy those floors which were originally designed for them to expand into. IIRC, the Portico also houses the only staff room / social area there is for WCC staff and presumably they are none-too-happy that they could lose this. I too am surprised that the WCC building is an S&T job. 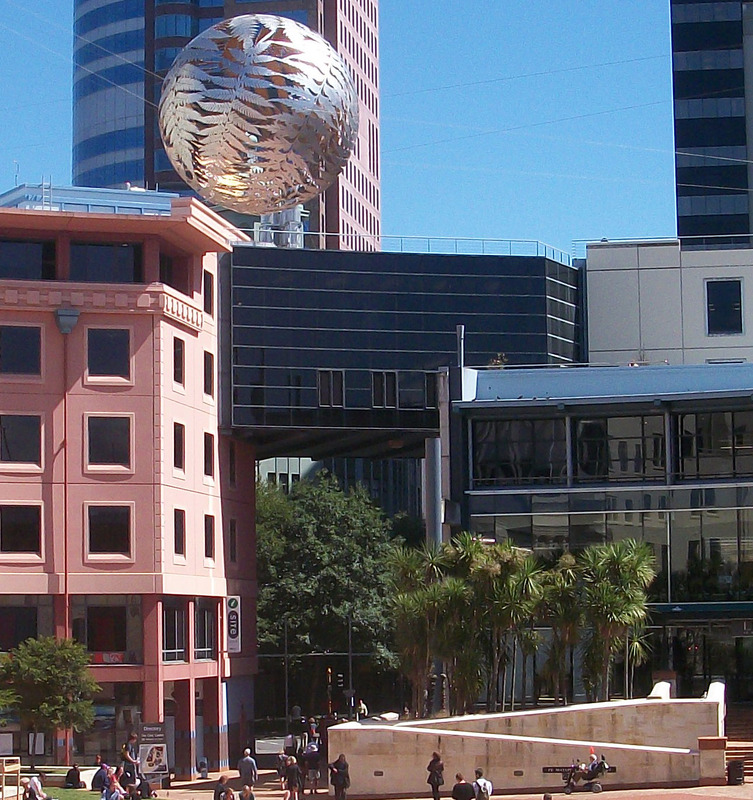 Re Civic Square’s desperate need for re-invigoration. Bring in more places to sit for a start. There’s a sad under-supply of seating, as if they don’t want people to hang around. Then more activities, agreed. And what’s happened to council policy on open edges? Lindsay – there is plenty of seating around the edges of the square, the real issue is, as you suggest, the lack of activity. The square is a dead place most of the time. None of the buildings around the square have activated edges, and the raised design of the square itself means that it is very difficult to achieve this, with most of the south side edges being at a lower grade. Of the current configuration of buildings, only the Gallery has some semblance of addressing the square in a formally competent way – but that mean little entrance doesn’t help to liven the place up one iota. The Library is too removed from activity by both height and obstruction (ramp access), and the town hall needs some big holes punched in it, and some activity to flow from within, into the square. Lindsay Shelton – you’re not wrong there! 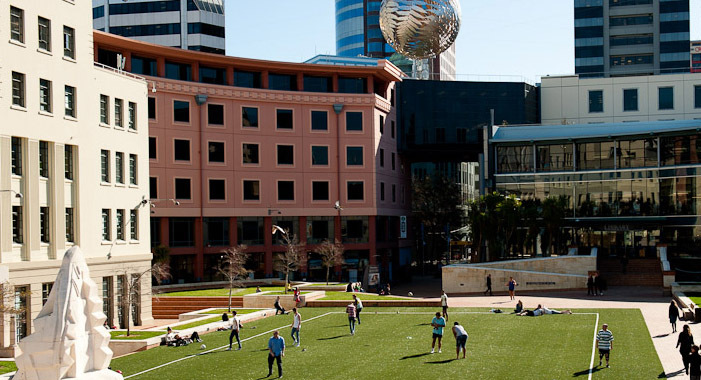 Civic Square has two things going for it – no cars, and lots of sunshine. But aside form that – what reasons are thereto visit, other than if you are on route to somewhere else? It really does need an extreme makeover. The front face of the Art Gallery is blank and dull and not at all interactive. It could do with an arts bookshop, a kiosk selling art-related objects, a live-sculpting master-class, an interactive videobooth etc. The ground floor of the Council building is mind-numbingly deadly, and should be largely vacated, to be replaced by somewhere to buy food, sit outdoors under stiff umbrellas (let’s not forget, that apart from today, we have wind sometimes), a used book stall, some Afro-Caribean buskers, a hula-hoop dancing school, and a place to pay your rates. I go there to have naps in the sunshine sometimes. That’s a pretty good reason. You’re bang on about Nikau Cafe, it’s on the wrong side of the building (also a bit pricey, come on). But Erentz, isn’t the fact that you can go there for a nice sleepy nap in the sunshine just more proof that it is failing as a bustling centre of the city? That as a civic heart, it is a dismal failure? I wandered thru Civic Square today and have decided that the portico definitely needs to go. Council staff will just have to socialise with the rest of us in Wellington’s cafes and bars. It isn’t really such a hardship. There is also an odd little bridge joining MFC with the old Town Hall and that needs to go too. I don’t think that there is any way to connect the two different architectural styles in a coherent fashion and the bridge doesn’t come close. I think MFC would benefit from being a stand alone structure, and Council staff won’t suffer too much if they have to walk out of one building in to the other. On another topic… I’m convinced the new jump platform at ‘Naki St Wharf is the best thing going on in Wellington at the moment. I spent a few hours there on Saturday and it was a ton of fun. sorry David – just rescued your comment from a folder full of Viagra spamverts – no idea why you ended up in there today. Anyway – a question – that new diving platform – you were diving, or just watching? Photos? david P: I agree that the odd little bridge between the Town Hall and the MFC looks pretty awful but it gets a hell of a lot of use when the two venues are used together for conferences. It may hit the dirt regardless when the TH gets worked over for its seismic upgrade. I’m often misidentified as spam. I’m just resigned to it by now. Regarding the jump platform… On Saturday there was a big crowd of watchers. We all oooo-ed whenever a trick went wrong or someone did a belly flop. We all laughed whenever a person with a giant puku bombed in and soaked some unsuspecting spectators. Which included an old woman in a wheel chair who had been pushed right to the edge by her family. But best of all were the nervous first time jumpers. We’d do count downs and other chants to help them build their confidence and it was brilliant drama watching their indecision play out. One young woman must have been at the top for thirty minutes before finally jumping… She’d been to the edge half a dozen times, and bottled out each time. Her friends were there and so we knew here name was Tania. We chanted “Let’s go Tania, let’s go”. It was epic human drama. And the jump platform is the perfect place to spend a once-in-a-generation Wellington heatwave. I haven’t jumped. I have taken photographs. They’re not online. I’m also inclined to agree that we could do more to enliven Civic Square, whether that is by bringing in activities more and/or by the way the buildings around it work. There are some significant temporary challenges which may give rise to opportunity. The strengthening of the Town Hall is programmed to start in July – life through work on the building ?? There’s also going to need to be decisions made about the Capital E building, and what should the role of Ilott Green be ? I think we could enliven the Visitor Centre somewhat (Ground floor of the Civic Administration building). Definitely an opportunity for clever thinking – something there is usually a lot of on this site. In terms of the little bridge linking Town Hall and MFC, that went in about 10 years ago. It is certainly valued from the perspective of conference activity so regardless of whether it survives the Town Hall strengthening some link needs to stay there. The one other comment to make is that whatever we think of doing the budget is going to be very challenging ! Regarding the jump platform on the wharf – my fear is that it will be removed as soon as someone gets injured on it, despite the percentage of safe jumps it has offered. In that respect, I’m surprised it even got built – a victory for good old-fashioned fun! That’s something you overhear the tourists (cruise ship types, I suspect) talking about… They can believe that this is all going on without lifeguards and safety fences and a bunch of rules. One asked me “Who is in charge here”. “No one”, I replied. “But someone could drown if you jumped on them”. “In that case they should be careful”. I reject the idea that all activity and adventure needs to be supervised by a public servant, armed with a bunch of rules and a cautious risk assessment. I love the way it works and I hope the Council don’t lose their nerve. And… It just occurred to me that this is going to be mental on Saturday with the Sevens. A jellyfish or a ray. I’ve seen a couple of them in the last week. It’d be nice if they’d attract some orcas. Chiming in from abroad, the bridge itself obviously provides a useful function, given the demarcation of office space in the building it connects. Wouldn’t an earthquake-resistant replacement be feasible? In terms of aesthetics it does look “meh.” I can’t tell from here or from Google Earth if the square as a whole is more cohesive when seen in person, but the bridge in any case does not provide a sense (in photos anyway) of either a “triumphal entry” into the square or an actual thematic bridging between the two structures it connects. But Maximus, where else will I go for my naps if you make it all trendy and hip!? Down at the jump platform… And it is closed, for “security reasons”. I have a hard time imagining what those security reasons are. Maybe the Council has intelligence that al Qaeda are targeting jumpers; or a team of burglars were going to jump off the platform, swim under the wharf, and tunnel in to Te Papa and steal our national treasures. But anyway, there were three security guards and a police officer there when I passed. The security guards were having trouble with people climbing up the side of the platform to jump and, concerned about the al Qaeda menace, were asking whether they could “trespass” people. So you have an immensely popular new facility, it is a brilliant sunny day, and it has been closed by the same Council numpties who fenced off a section of Willis St last year for no reason at all. Epic fail, Council. It was another sunny day Sunday, so I was down on the waterfront. The jump platform was still closed this morning due to the security situation. But the Council security force had gone home so there was no one there to threaten jumpers with arrest. Everyone was just climbing over the rope barrier and jumping. It was a very odd situation and I suppose we just have to be thankful that WCC aren’t in charge of security at Wellington Airport, otherwise the only thing stopping people taking guns and knives on to aircraft would be a sign and some string. When I passed by in mid-afternoon, the platform or the jumpers were still at risk due to the security threat. But the jumpers had partially disassembled the rope barrier. They obviously didn’t stop to consider the dangers presented by terrorists or criminals and were treating this serious situation as if it were just a chance to play in the sun. By 4pm the rope barrier had been removed completely. I presume the security threat had passed without incident. I’m keeping an eye on the news in case the Police announce the arrest of some swimming jihadis or something, and will be reassured to hear that jumping in to the harbour no longer endangers the security of NZ. No idea what the ‘security threat’ was but I’d hazard a guess that it was more likely fear of tipsy Sevens revelers mixing their drinks or mixing in the drink – were any dressed as Al Queda (what do they look like anyway ?) – that would be a fiendish disguise indeed. I agree that the portico is an ugly after-thought and should go. I suggest that a unitary, Wellington-Hutt-Porirua-Kapiti council should be headquartered at Lower Hutt for two reasons – cheaper capital cost and as a central location being fairest for all residents of the area. The Wgtn Town Hall could be still be used for functions or a museum but moving everyone before a possible amalgamation instead of after seems short-sited and spendthrift of ratepayers money. ps. I petitioned WCC to change Civic Square’s name to ‘Sir Edmund Hillary Plaza’ but they didn’t go for it. 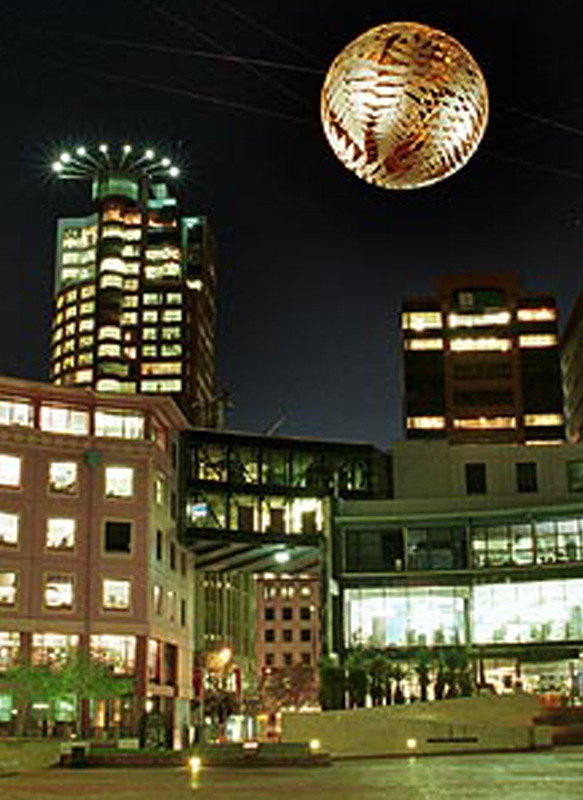 What has been done in Wgtn to honour Sir Ed? And why do we persist in naming places in such pedestrian ways? North Island, Island Bay, Civic Square. It’s so white-bread, new speak-like.